So this shot is nearly a polar opposite from my last post. Whereas the last shot was soft and subtle, this is more of a loud statement around texture and detail. 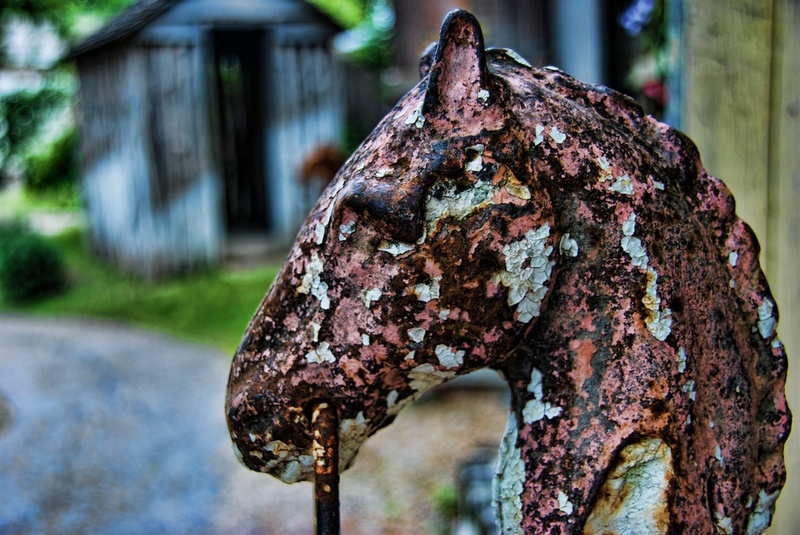 I found this horse head pole in the rear courtyard of a restaurant down in New Braunfels, TX and just loved all the texture and detail it possessed. I have started looking more for "the little things", that is to say that I am no longer just trying to find beautiful landscapes to photograph (though they remain my fave). I am enjoying shooting what I like to define as "common objects", or just "stuff" instead of "places". I think you know what I am trying to say, though I don't think I am saying it too well! The thing I find interesting about this style of photography is that it forces me to really pay attention to where I am, looking at objects and angles - and I think that makes me more aware of what I am doing with the camera on all my shots. Single exposure at f/5.6 to get some intentional background bokeh, then ran it through PSE and Topaz Adjust to accentuate the detail and texture.